admin, Author at California Consulting, INC.
Francine Castanon, California Consulting Associate, recently attended the Ventura County Special Districts Association (VCSDA) Chapter Meeting. California Consulting is proud to represent special districts throughout California. Dr. Julie High is a Project Manager for California Consulting. Julie has over twenty-five years experience in grant writing for education. She has secured more than $35 million in educational grant funding, with over $25 million for one school district. Julie has experience working in many roles in public education: high school teacher, staff development specialist, middle school instructional coach, preschool director, after school program director, elementary principal, and director of program evaluation and IT. Throughout all of these primary roles Julie focused on improving education for traditionally underserved populations with successful Federal and State grant funding. In 1994 Julie organized a community collaborative of private businesses and social service agencies to improve services to the outlying community. This collaborative continues to meet and promote community health through its current family resource center base. 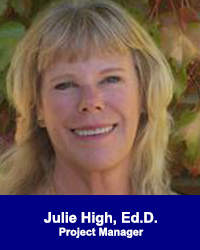 Julie earned her Bachelor’s degree from UCLA, Master’s degree from San Jose State University, Professional Administrative Credential from the University of Santa Clara, and her Doctorate in Education from Fielding Graduate University. When she’s not writing grants, Julie can be found riding and competing in upper level dressage with her Lusitano gelding, Cefiro do Ceu. 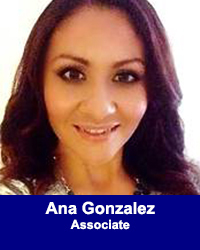 Ana Gonzalez is a progressive leader within the Public and Community Affairs industries with over 15 years of direct experience with non-profit and housing counseling agencies. Guided by her commitment to community, Ana has navigated a unique career trajectory in both private and public sectors. In the public sector, Ana served as a consultant and partnered with various non-profit organizations and found her home with Neighborhood Housing Services of Orange County (NHSOC). During her service with NHSOC Ana built the foundation for their prevailing housing preservation program and became a founding member of the Orange County Housing Collaborative. Being recognized as a subject matter expert, she contributed to various media outlets and campaigns. Most notably is her work on the Anti-Scam campaign in collaboration with the Federal Trade Commission. Ana also served the private sector as the Assistant Vice President of the Office of Community Affairs for U.S. Bank. Focusing on Housing Initiatives, Ana successfully managed programs, grant administration, and served as a government relations liaison for housing related legislation across a 25 state footprint. She also represented the bank internally as a member of the Diversity and Inclusion Committee and Community Reinvestment Funding Committee. Ana currently serves as Board Secretary for the Housing Opportunities Collaborative, Committee Member of the Orange County Veteran Housing and Homeless Working Group, Board Member of Orange County’s Youth and an Advisory Member of Women in Diversified Services. Previously Ana was a contributing member to community initiative taskforce groups with both Congresswoman Loretta Sanchez and Senator Lou Correa and past Board Chair of Neighborhood Housing Services of the Inland Empire. Ana’s unwavering commitment to community was recognized in 2014 when she was awarded the Woman Making a Difference Award, representing the 34th District of Orange County. Ana holds a Bachelor’s Degree from Chapman University majoring in Pre-Law. An Orange County Native, Ana is a proud mother of two and happily resides in Santa Ana. 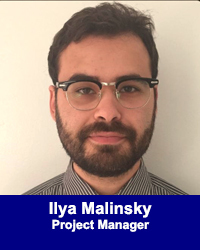 Ilya Malinsky joins California Consulting as our Project Manager. With over a decade of professional writing experience, Ilya Malinsky has authored a wide range of successful grant proposals focusing on social services and education. During the last fiscal year, Mr. Malinsky, helped secure nearly $1 million in grant funding. Ilya has secured funding for a number of publicly and privately funded projects serving low-income communities and student populations. Projects have included educational and skill-building programs in underserved urban communities, programs for pregnant and parenting high school students, and comprehensive after-school programs for middle school students in cities including Los Angeles, Chicago, and Washington, DC. Ilya earned his Bachelor’s degree in Journalism from Boston University. 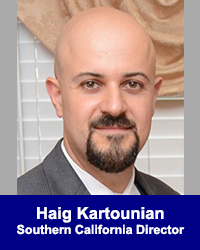 Haig Kartounian has extensive experience in the public sector that spans over a decade. He began his career as Deputy District Director for policy and appropriations at Congressman Adam Schiff’s district office. He synchronized legislative efforts from conception to enactment, liaised with government agencies, organized community outreach events, and advising the Congressman on issues ranging from federal funding initiatives, international relations, transportation, and the environment. In 2010-2011, Mr. Kartounian advised the U.S. Department of State’s diplomatic mission in the Middle East on governance, infrastructure development, public diplomacy, and linguistics. Most recently, Haig served as Deputy Director of External Affairs for State Controller John Chiang. His responsibilities included partnerships with state and federal agencies for financial awareness, fraud prevention, and tax seminars, in addition to assignments that increased the transparency of public institutions. Haig’s professional experience includes assignments with the U.S. Department of Commerce, U.S. Department of Justice, Superior Court of California, Los Angeles County Registrar Recorder, and the Los Angeles World Affairs Council. Haig holds a Bachelor of Arts in Political Science from the California State University, Los Angeles, a Master of Arts in International Studies from the Claremont Graduate University, and a Master of Business Administration from Pepperdine University’s Graziadio School of Business and Management. 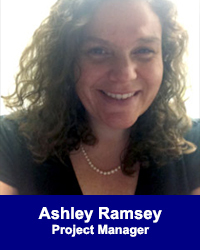 Ashley Ramsey has a Bachelor’s of Science in Planning with an emphasis in Regional and Environmental Policy and Planning from the Massachusetts Institute of Technology. She has professional experience in health care administration, quality control and regulatory compliance for biologics, and early childhood education. Ashley also has experience in starting and operating an educational community service organization and a biotech firm. She is interested in transportation planning, social program design, and healthcare access. Ashley loves to support social businesses and municipalities as they strive to maximize their positive impact. 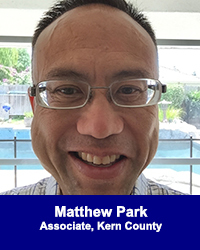 Matthew Park, California Consulting Business Development Associate, from Bakersfield, California, has held positions in the Federal and County government, non-profit and corporate government relations. His background includes working for the United States Senate and the County of Kern, serving on the staffs of elected officials, for almost 20 years. He was then appointed to become the Executive Director of the Kern County Farm Bureau for almost 10 years. Most recently, he was the Senior Government Relations Representative for Pacific Gas and Electric Company. Earlier this year, he began his own government relations consulting business. Matthew resides in Bakersfield with his wife and two young daughters. Diana Dinerman is a project management and communications professional offering fifteen years experience in creative, corporate and academic writing. A Washington, DC-native, she previously worked for the Patent and Trademark Office, Department of Defense, and the Department of Justice, serving teams from the Department of Homeland Security (DHS) and the Bureau of Alcohol, Tobacco, Firearms, and Explosives (ATF). After working as a government contractor, she transitioned to the non-profit sector to build successful grant programs for mission-based organizations. As a non-profit consultant, Ms. Dinerman secured over one million in private foundation and government grants to support arts education for underprivileged youth, and public access to the performing arts. In the private sector, Ms. Dinerman was the Director of Project Management for a digital agency, where she supervised over five million in accounts, delivering scalable, web-based business solutions to corporations, lobbying and advocacy groups, and membership organizations. 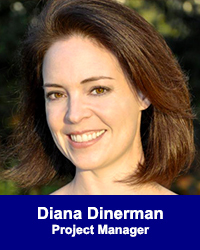 Ms. Dinerman is a graduate of Indiana University and the George Washington University. She was a writing instructor at the George Washington University and taught American History at the University of Minnesota during her PhD. Ms. Dinerman has received many grants for her historical research, and was a research fellow at the University of Minnesota, the New York Public Library for the Performing Arts, and the University of Southern California. Ms. Dinerman is pleased to offer her project management and grant writing skills to serve California Consulting’s municipal, education, and non-profit clients. 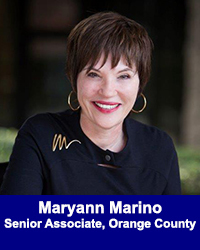 Maryann Marino has over twenty years of hands on experience in public relations services, media relations and public affairs advisory services working as a consultant after she left the public affairs office of the California Department of Social Services, where she served for five years as part of Governor Pete Wilson’s administration. Prior to serving in state government, Maryann was the government affairs officer for an inner city disproportionate share hospital and did political fund raising. She has directed statewide multi-media campaigns, led crisis management efforts, developed image branding for organizations and issues and provided political advocacy services. Maryann has received national recognition from the American Tort Reform Association for her collaborative effort with the development industry to educate homeowners about alternatives for settling construction disputes. 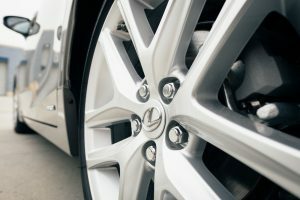 She also received the Ruby Slipper Award, on two separate occasions, from the Building Industry Association of Orange County. Maryann Maloney earned a B.S. degree in business administration from the University of Southern California and is a graduate of the CORO public affairs program. She serves on the St. Francis Medical Center Foundation Board of Directors. She is a member of the Orange County Public Affairs Association and the Orange County Business Council. With 20 years experience in the education market, Ben has been a teacher, a program director, and a consultant to major education publishers and research firms. His background includes a Bachelor’s degree in applied geophysics and a Master’s degree in curriculum design and implementation. 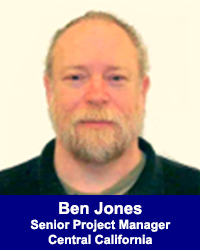 In the course of his career, Ben has developed significant expertise in topics as such as STEM, curriculum development, curricular analysis, observational studies, alternative education models, project planning, project funding and management, and professional development at both the policy maker and practitioner levels. In 2007, he co-developed the concept of cognitive rigor (sometimes referred to as the Hess Matrix) and continues to further develop the concept into practical K12 applications designed to create more effective instructional models focusing on proactive learning experiences. Ben has strong interests in the educational sector but brings a broad set of skills to the table for most any project from school related to municipal to community enhancement. His projects to date have focused on water resources, urban greening, and infrastructure grants.